Pick Analysis: Ross was just getting started on his way to stardom in Washington when he tore his left ACL in the spring of 2015. He had become known as a kick returner (three TDs in 2013-14) and big-play receiver in limited touches (16-208, TD in 2013; 17-371, 4 TD in 2014) before having to redshirt his third year at UW. In fact, coaches liked Ross' athleticism so much he started three games at cornerback (INT, two pass breakups) in a season he gained honorable mention All-Pac-12 honors. In his return to the field in 2016, Ross became a star, garnering second-team All-American honors and first-team All-Pac-12 accolades with 81 catches for 1,150 yards and 17 touchdowns (tied for second in the nation). Published: April 27, 2017 at 09:19 p.m. 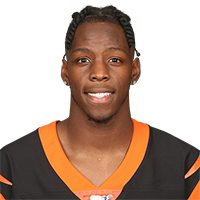 The Cincinnati Bengals select Washington wide receiver John Ross No. 9 overall in the 2017 NFL Draft. Published: April 27, 2017 at 11:54 p.m.
NFL Media's Ike Taylor and Dave Dameshek talk to John Ross after he is drafted at No. 9 by the Cincinnati Bengals. Published: April 27, 2017 at 09:18 p.m.
NFL Media's Matt Smith, Bucky Brooks, and Lance Zierlein give John Ross an A- draft grade. Published: April 22, 2017 at 05:39 p.m.
DeSean Jackson takes draft prospect John Ross under his wing before the 2017 NFL Draft to teach Ross the keys to being a successful NFL wide receiver. Published: March 4, 2017 at 12:42 p.m.
University of Washington wide receiver John Ross runs the 40-yard dash with a record-breaking time of 4.22 seconds, besting Chris Johnson's 4.24 time. Published: April 4, 2017 at 05:50 p.m.
How close was Washington wide receiver John Ross to quitting football? Here are five things you should know about the 1st-round hopeful. Published: March 14, 2017 at 06:03 p.m.
Before University of Washington star John Ross was staking his claim as arguably the fastest man to ever enter the NFL, this wide receiver was outrunning his classmates in Long Beach. Published: April 7, 2017 at 06:30 p.m.
Washington wide receiver John Ross joins "Path to the Draft" to discuss his college career and expectations for the upcoming 2017 NFL Draft. Published: March 11, 2017 at 04:13 p.m.
Watch the fastest player at the 2017 NFL Combine, University of Washington wide receiver John Ross, run routes and catch passes at his school's pro day. Published: April 3, 2017 at 04:46 p.m.
Washington wide receiver John Ross goes through drills at the 2017 NFL Scouting Combine. Which team would be a good match for John Ross? Published: March 4, 2017 at 01:19 p.m. The "NFL Now Live" crew discusses which teams could be a good fit for Washington wide receiver John Ross. Published: March 6, 2017 at 08:07 a.m. The "Good Morning Football" crew discusses what he learned about Washington wide receiver John Ross' potential from the NFL Scouting Combine. Published: March 11, 2017 at 03:56 p.m.
University of Washington wide receiver John Ross talks about whether his life has changed since running a 4.22 at the NFL Scouting Combine and what he wanted to prove at his pro day.